HistGeogUni Lecture 2018 – Thank you, Heather! 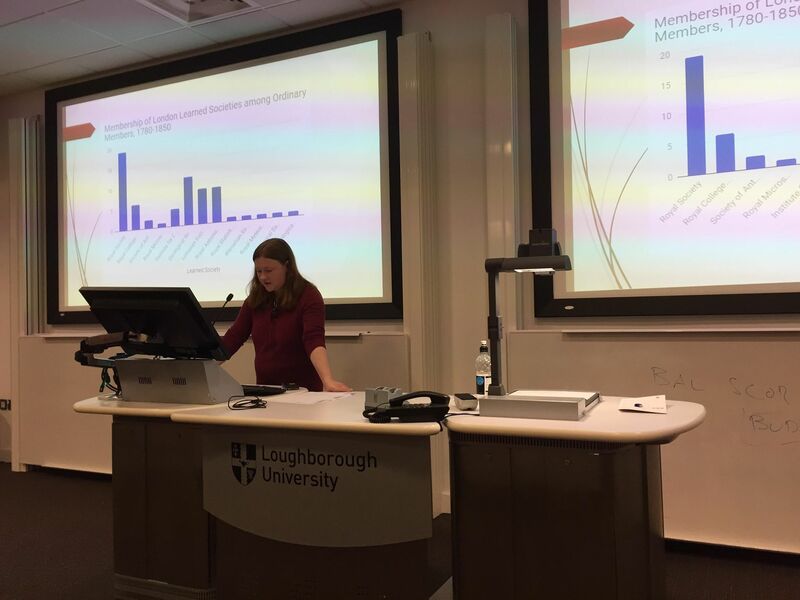 After the end of a long and work-intensive semester, we are happy to report that Dr Heather Ellis (University of Sheffield) delivered a fascinating HistGeogUni Lecture 2018 on 4 May to a large audience of geography students and colleagues as well as visitors from across Loughborough University and places as far as York. Heather presented her research on the nature and networks of literary & philosophical societies in Britain, 1780-1850, focusing on the one founded in Manchester in 1781. According to Mee & Wilkes (2015), “[o]ther times and places had seen major changes in technological advances … but distinctive to eighteenth-century Britain in [Mokyr’s] eyes was its belief that progress was possible across the board and ‘useful knowledge […] a source of hope and excitement’ … the literary and philosophical societies played a distinctive role in the Industrial Enlightenment, especially those in the newer urban centres of the north” (pp. 599-600). The Manchester Philosophical & Literary Society united members from across all classes and relatively few university academics because this institution served knowledge production in the public sphere. At a time prior to disciplinary specialization, most publications appeared in chemistry, medicine and the classics, while the wider geographies of European knowledge production in the late 18th and early 19th centuries, represented by the places in which those Manchester society members with a university degree had received their university education, identified Edinburgh, Leiden, Paris, Göttingen and St Petersburg as the most attractive knowledge hubs of the era. Many thanks, Heather, for a fascinating lecture!